For telemedicine to take hold across the country, especially in rural areas, government and industry must invest in broadband infrastructure and adoption, senators and witnesses said in a Senate hearing Tuesday. In a Senate Commerce, Science and Transportation Committee hearing about the "internet of things" in the rural U.S., witnesses focused on how broadband—and the lack thereof—affects the adoption of connected technologies in healthcare, and other industries. Broadband access affects telemedicine and remote monitoring, which hold promise only if they can be deployed. 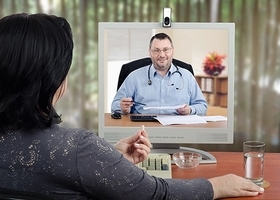 While remote monitoring of patients in their homes is possible on lesser networks, broadband is necessary for things like video visits, according to Michael Adcock, a witness in the hearing and executive director of the Telehealth Center at the University of Mississippi Medical Center, Jackson. "As the technologies advance, there's going to be more and more done in a patient's home," Adcock said. "We need to be able to have high speed internet in patients' homes that's reliable and available." Adcock supports legislation like the Rural Wireless Act of 2017 and the SPEED Act of 2017 to achieve that expansion. The acts would require the Federal Communications Commission to consistently collect commercial mobile coverage data and make the process for getting permits for broadband infrastructure more efficient. The FCC recently came up with a curious way of expanding broadband access: the agency changed the definition, lowering it from 25 mbps to 10 mbps, which would have boosted the number of people who count as having broadband. But it's a change no one in affected industries is asking for, according to those in the hearing. "They're playing with words as opposed to helping people get broadband," Sen. Brian Schatz (D-Hawaii) said. To actually help people get broadband, the government must adopt an "organized federal strategy," said Angela Siefer, executive director of the National Digital Inclusion Alliance. Siefer has personally seen the effects of remote monitoring, as it helped her father in the last years of his life. The VA provided the connected device he used to monitor his breathing. "The VA is a leader in telehealth," Adcock said. The agency recently proposed allowing telehealth to be practiced across state lines in a bill set to be voted on in the U.S. House of Representatives on Tuesday. But for that care to truly succeed, widespread broadband would be necessary, as such care would involve video visits. When it comes to those kinds of visits, "we're going to run into a lot more connectivity issues in the home," Adcock said.